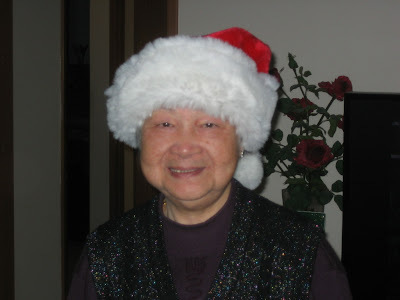 Hunny Bunny's mom has never given me a Christmas gift. And I never expected one, especially since we've never spent the holiday together! I suppose because of the impending nuptials, she decided to send me a little package - a gift card to Nordstrom! Momma Bunny knows me so well. Anylucky, MB didn't write how much was on the card so I decided to call the hotline and see what the balance was. To my utter delight, the card had an extra 'zero' to number I was thinking. I won't go into details because talking about money is soooo tacky, but let's just say it was nearly enough for me to pay for both of these teeteringly tall beauties that I had presaled on Christmas Eve to be picked up on Boxing Day. I had a couple other gift cards (thanks Veen!) and only had to pay $25 to cover the rest. 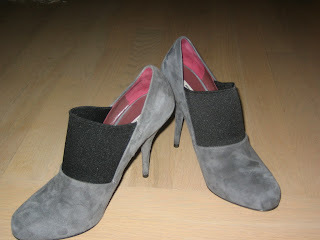 I heart these grey Miu Miu suede booties. There's just a little bit of a hidden platform so they're not that high. And the Jimmy Choo T-strap Mary Janes? Fahgettaboutit! Sure they're sky high and I can barely walk, but dang it. I'll get used to it, right? I mean after my snowboarding accident three years ago, I really haven't been that adventurous in heels. I think its high time I get back to wearing them. Don't you agree? What better way to recover than to jump right back in? Feet first. Thanks for the shoe spree Momma Bunny! One side note, Hunny Bunny was a little peeved that all he got for Christmas from his momma was some long underwear. Better than lumps of coal, I say! he thinks therefore he is... THE BEST! I really shouldn't be making such a big deal out of this Christmast gift because after five years, shouldn't Hunny Bunny know what I love? Hello? Just look at my blog and there are tons of ideas on what to get your favorite girl - it's basically one big shopping list. But since my hints are not so obvious to someone so oblivious, I suppose it's quite the momentous occassion when HB actually goes into Barneys by himself and chooses something lovely by himself for his lovely (that's me). Previous Christmases and birthdays and other celebrations included either electronic items, such as iPods and iPhones, or gift cards - not the most romantic or thoughtful. But I've come to accept and expect it so imagine my surprise when he handed me the big blue box (unwrapped no less)! 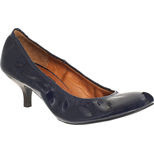 How much do you love these navy patent Lanvin ballet pumps? Not something I would buy for myself, mainly because for the price, I'd buy something less sensible. I've always admired them though. 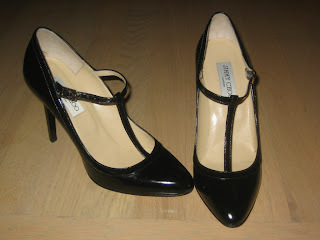 Did I mention they were Lanvin? AND navy patent? In between all the squealing and hugging, I made sure to reiterate that designer shoes = happy LRB, always. A few months ago, I read an Allure magazine article about a new hair product called No Frizz by LivingProof. In my quest for frizz free hair, I'm always willing to try new products. No Frizz actually had something new to add to the plethora of hair product out there - instead of using the same old frizz technology, they came up with some sort of new smart person thing, PolyfluoroEster. If you're interested, you can read all about how it works on their site. Anyway, I decided to order one to try. After I placed my ordered though, I received an email from them saying that they were going to be on QVC that weekend. Of course I totally had to watch! It was pretty interesting but I was mainly interested (and annoyed) with the fact that they were offering TWO tubes for a lower price. I was starting to feel ripped off for buying it so hastily on their website. But to my surprise, when I received my package a few days later, they sent me two (one for wavy styles and one for straight styles) as a thank you for being a charter client! About a month ago, I received another email from LivingProof calling for volunteers to test out their shampoo/conditioner line. Of course I volunteered. Unfortunately they had a huge response and I wasn't chosen. But then as a thank you, they sent me another tube of the stuff! Last week, I received a random package. At first I thought it might be a Christmas gift from someone so I looked at the return label and realized it was from LivingProof again. I opened the package to find that they sent me four tubes of the product. Two for me and two for me to share with friends! Isn't that crazy? I got seven tubes for the price of one! Dang it. I have no excuse for bad hair days now. As for a review of the product, I really like it. It has a really light, bright scent and it actually works! It doesn't leave my hair greasy or weighed down. The one drawback is that you have to use quite a bit in order to saturate your hair, but I don't have to worry about that because I have a ton of back up now! 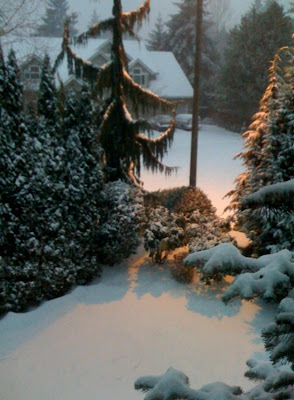 It's a mutha effin' winter wonderland out there! This is the view outside of my window. Don't get me wrong, I love the snow. It's just not as fun when I have to go in to work. Not only am I almost out of vacation time (they're closing the office between Christmas and New Year's and making us use our vacay, as a cost saving measure) but I also had a couple deadlines to meet - so much for hording time off for the wedding! Anyway, the snow is crazy deep. I'd say a good 12 inches or so at home. Almost to the top of my tall Ugg boots! I don't think I've ever seen that much snow without heading to the slopes. I guess it's good that I'm at least out of the house now. Spent most of yesterday watching Dexter DVDs. Have you seen that show? Hunny Bunny heard it was good so he got a hold of them. It's a tad disturbing but enjoyable. I'm just glad it's not super gory especially since it's about a serial killer. On a lighter note, I was complaining to my boss about how hot it was in the office and he told me I should take off some of my layers. Ugh. I just stared at him and retorted indignantly, "Umm.. This is an outfit. I can't just 'take off a layer.'" Duh. 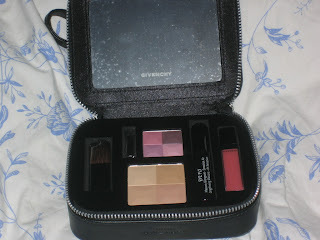 Remember that Givenchy giveaway I told you about last month? I wasn't really sure how legit it was at first, but to my delight, the little package has arrived! In fact, the speediness of the delivery was rather copacetic. I hate having to wait the usual 8-12 weeks for free stuff. Don't you? Included in the Very Couture palette are an eyeshadow quad with purple-y pink colors, a pressed powder quad, a deluxe sample size sample mascara, sample-size lip gloss and a couple of mini brushes. I'm not sure if the colors are really me but I'm sure if I play around with them, I can make it work. The nice thing about it though is that the tray of makeup can be removed from the pouch so I'll be able to use it for something else. I love the giant mirror. I don't know if the promotion is still going so send in your request at your own risk. Good luck! Just a couple letters off! We're practically the same person. Who wore it better? Probably Lauren Conrad, but I'm sure I got thea better deal! 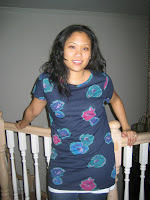 I picked this top up at the Rack for $35 - a savings of over $100. Dang. My hair looks crazy though. I need a haircut. And a brush. Miss Rhondalei of leileiluvsmakeup tagged be and boy do I feel special! Directions: Once you’ve been tagged, you have to write a blog with sixteen random things, facts, habits or goals about you. At the end choose ten people to be tagged, listing their names and why you chose them. Don’t forget to leave them a comment (“you’re it”) and to read your blog. You can’t tag the person who tagged you. Sixteen seems like a lot of info but here goes. If there's only one piece of anything left such as cake or meatballs, my brother and I like to dare each other to eat it in one bite. I hate shaving my legs. Hate. Umm.. I don't think I've shaved them since my Mexico trip in June. Thankfully, I'm not particularly hairy. Is that tmi? On nights when I have a hard time falling asleep, I usually put on a pair of socks and then I'm knocked out. I've fallen down stairs at multiple clubs in Seattle and I wasn't drunk - just clumsy. My first job was scooping ice cream at Baskin Robbins. 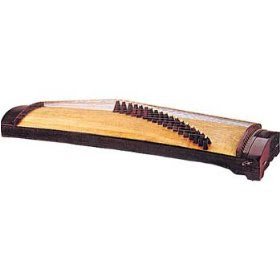 I played the Chinese zither for about 10 years. I'm a little guilty that I've given it up. I should pull it out again and see if I remember anything! I don't like crunchy stuff in my food e.g. nuts, croutons, chocolate chips (unless it's a cookie...) In fact, I really don't like mixing textures in my mouth. My dad bought me a brand new 5-speed VW Jetta when I started college. It sat in the garage for nearly a month because I didn't know how to stick shift yet. And then when I took it out with my brother, I hit a bus. I faint. Literally. My doctor thinks it's because of low blood pressure. I think it's because I want all eyes on me. Just kidding! But I have fainted 5-6 times in the last several years. I love back to school shopping even though I haven't been in school for ohhh.. 9 years.. Come September, I always hit up Target for fun notebooks and pens. I like Sanrio notebooks too! I have to force myself to drink water while at work otherwise I'll go the entire day being dehydrated. It's not that I don't like drinking, I just don't like going to the bathroom. When I was in school, I'd hold it until I got home because I didn't like the bathrooms at school. Speaking of bathrooms: I was in the WC one night at a certain restaurant. The bathroom was soooo weird. It was one of those single bathrooms where you have to lock the main door but this bathroom had two toilets but no partition between them.. Anyway, I THOUGHT I locked the door but apparently not all the way. Next thing you know this woman barges in while I'm using the loo! I totally yelped! And as she was about to excuse herself from the bathroom, she notices the second toilet and asks if I minded that she came in! She then proceeded to lock the door once more and take off her pants and use the other toilet right next to me!! WTH! "Oh it's ok.. It's just you and me.." then she goes on to say how weird that there's no wall between us. Did I mention that I'm still peeing?? I finish quickly and hop up to wash my hands. Then I ask her if she minded if I opened the door to leave (I didn't exactly want to stay in there while she was doing her thing.) "Sure! Go right ahead!" Ok.. this is too hard. I owe you four more random facts about me. And I'm too lazy to tag people. So if you read this. You're it! I knew I watched this show for a reason! Rebecca, on the series Brothers & Sisters, was wearing the Rebecca Taylor dress that I picked during a recent trip to San Francisco. Seriously, does anyone else watch this show? I guess I kinda like it but it's so formulaic. Every week it starts with some sort of dilemma. Then everyone fights and resents each other for the next forty minutes. Then everyone starts crying and more feelings are hurt. Then someone apologizes and then they all kiss and make up. And of course I cry nearly every episode. Sometimes a girl just needs some release! Go to my wedding blog to see what I just bought! 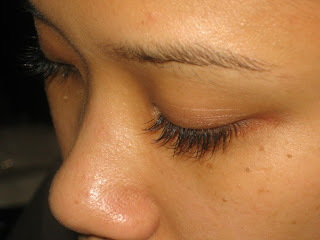 My girl friend and fellow blogger Miss Leilei has been raving about her recent foray into the world of eyelash extensions. After seeing her results, I knew I had to give it try. Longtime readers will know that I have a minor obsession with lashes and mascara. But now I don't have to worry about either! I had Christine of Lady Lam do the ultimate glam lashes on me over the weekend. It took about an hour and a half and was completely relaxing. I can't believe how long my lashes are (and surprisingly natural looking!) They're also unbelievably light. I forget that I have them on. I'm definitely doing this again before my wedding! I won't have to worry about mascara running down my face if for whatever reason I find that I'm not completely dead inside and start crying tears of happiness. Most likely that won't be the case because, you know... I'm dead inside. Ugh. But when did I get all those freckles?? And please don't mind my nasty brows. I'm do for some threading. Yes. I did some damage this weekend because obviously I have zero control over my wallet. In my defense though, it was 60% off! So here it is! The Balenciaga lamb cutout bag! I love that I can wear it three different ways! It's like I got three bags for the price of one! Or as I like to say, I got two bags for free! 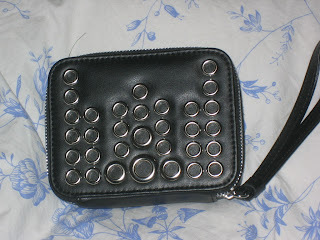 I'd be eyeing for several months now, but I had a feeling that since it wasn't one of the it bags, it would go on sale. Besides, I'm in no position to drop $2K on a bag. When it was 40% off, I was really tempted to pick it up then, but decided to wait it out. Leave it up to fate, if you will. 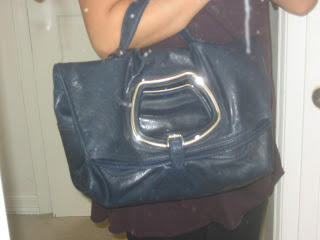 I nearly had a meltdown though because the Lanvin suede hobo that I'd been coveting as well went down to 60% off too! 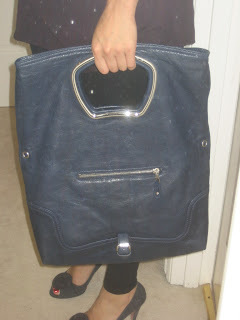 But for practical and financial reasons, I chose the Balenciaga. 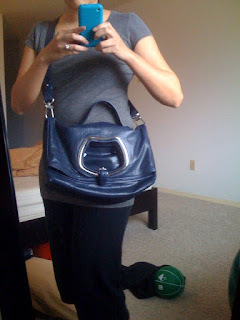 I still love that bag and if anyone wants to splurge (read: HB) on my Christmas present, I would be absolutely thrilled. Again, my apologies for my ghetto photos. I'm such a lazy blogger! I spy: For those of you with a keen eye, you may have noticed that I'm wearing a certain pair of grey Prada peeptoes in one of the photos. More on that later! More layoffs at work this week. I'm safe. I think. For now. The newish gal was messing around with contact lists and some how deleted the contacts for all of my projects. Bah! I really need to work on this picture taking thing. Anyway, I went to a boot camp class yesterday and holy crap. Imagine an entire hour of "Jump side to side. Now jumping jacks! 40 more! Glide side to side like you're speedskating! Now drop to you knees and give me double count pushups. 20 more! Now singles! Give me 15! Back up and let's squat! Sit way back! Now hold for 30! Feel the burn! Now run in place! Faster! Like you're training at football camp! How about some leg lifts! Work that booty! Are you feeling it? Give me 20 more! Now the other side! Ready for some abs? Oh yeah! Don't you feel great! Now double count! Give me 20 more! Crunch it! Should we do 20 more? Yeah! Singles!" I seriously can't walk. I really shouldn't be wearing my Chanels because they're not helping me with my gait so I'll just stand here. UPDATE: Have been getting compliments from coworkers on the shoes today. Woohoo! I'm doing something right.